This recipe is really easy and I love it. I use different vegetables all the time, they are all good. I’m so in love with these oven-roasted veggies. They are so easy, good and versatile. One of the best things about roasting veggies is you can use any fresh veggies you like. I often like to use up what I have on hand or include veggies that I got a good deal on at the farmer’s market. The blend I used in this recipe is one of my favorites, but I often use different types of zucchini, summer squash, cauliflower, carrots, snow and snap peas. I find that about 12 cups of chopped veggies will cover a large cookie sheet, which helps me decide on quantities when I’m shopping for veggies to roast. Once in a while, I like to dress this right up a bit so right before I serve them, I’ll sprinkle them with a little fresh grated Parmesan or some chopped pecans or almond slivers. Adding a handful of toppings is a quick and easy way to make your roasted veggies look extra-nice and give them even more flavor. One of my favorite things about roasting vegetables is they require very minimal prep. For the asparagus in this recipe, all you have to do is cut the white ends off since they’re a little tough. I also cut the very ends of the green beans off just to make them look a little neater, but they roast just as well if you skip this step. I get the best results using fairly large chunks of peppers and onions since they shrink quite a bit as they roast. Now that I’ve made vegetables this way, it’s the only way one of my children will eat vegetables. He only likes them slightly burnt too, which takes out a lot of the nutritional value because the more a vegetable is cooked, the more the nutrition gets cooked out of it. So if you want them to be healthy, cook them for a shorter and use a healthy oil, like coconut oil, olive oil or avocado oil. Also, go light on the oil and only add what you need to. Some of my favorite vegetables to roast are asparagus, squash medley (that means zucchini, summer squash, onion, green pepper, red pepper – whatever you like! ), broccoli and green beans. You can adjust the amount of time you roast the vegetables to suit your taste. 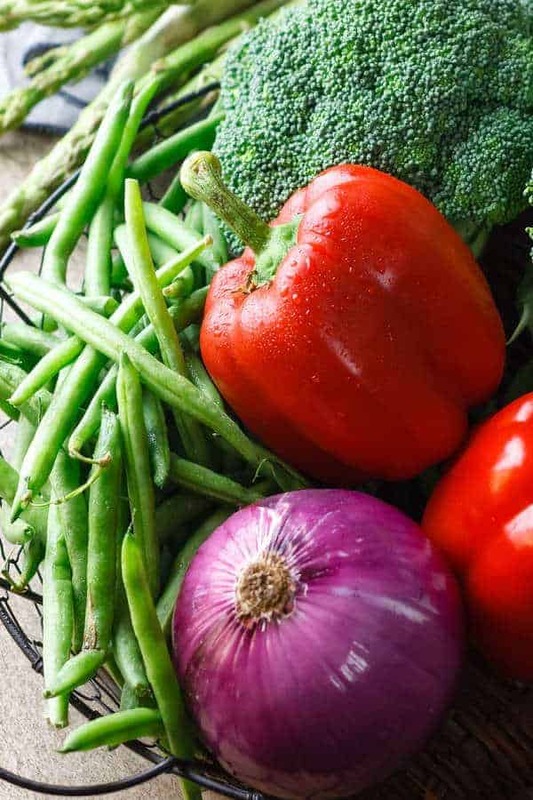 If you prefer your veggies with a little crunch and fresh flavor, try decreasing the roasting time by five to seven minutes. You’ll get a good gauge of how close they are to being done for you when you stir them after ten minutes of roasting. I like mine with very caramelized, savory flavor, so I let them roast for about 20 minutes, sometimes a minute or two more. The first few times I roasted veggies, I waited ten minutes before adding the onions and peppers. They cook quicker than tough veggies like asparagus and squash, and I was afraid they’d be burnt by the time everything else was done. Then the other day I decided to just throw everything in together, and I was pleasantly surprised by how good the peppers and onions turned out. The red peppers got very soft and juicy, and onions were totally caramelized. If you love that savory, caramelized flavor, roast all the veggies at the same time. For this recipe, I added 1 1/2 teaspoons of salt, which definitely makes the veggies delicious. I don’t always use that much though, and if you’re watching salt you can add less and they’ll still be very tasty. If you’re on or cooking for someone on a salt restricted diet, try adding 1/2 a teaspoon of salt with a teaspoon of your favorite no-salt herb seasoning blend. You don’t need much oil at all to roast vegetables. 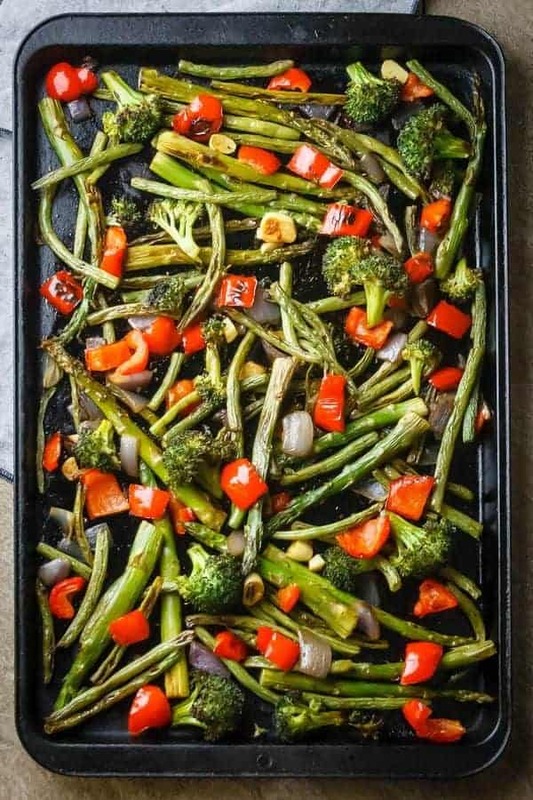 For this recipe, I used 1 1/2 tablespoons of olive oil, which is my favorite roasting oil because it’s a healthy fat and I like the taste it gives the veggies. 1 1/2 tablespoons make them a little richer and satisfying, but I often use a scant tablespoon if I want to make them a little lighter. 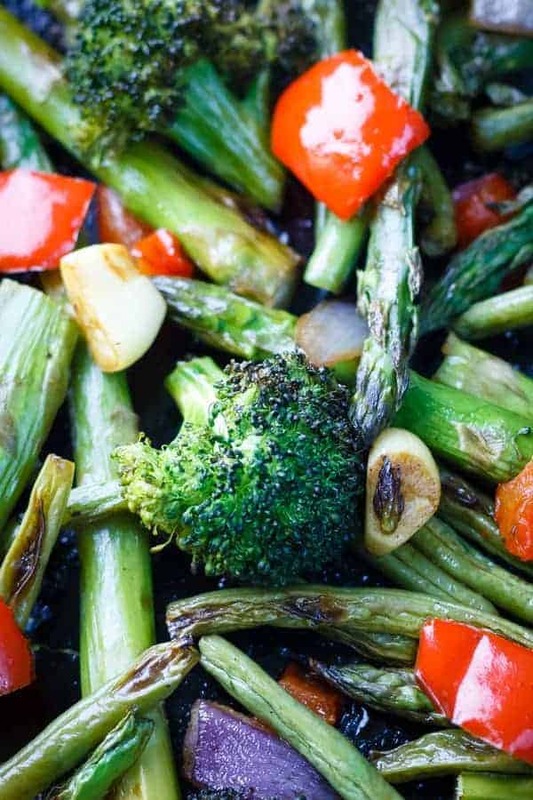 Coconut oil, avocado oil, and safflower oil are also great choices for roasting vegetables. You can use a Silpat baking mat to roast your vegetables, but in my experience, it’s not necessary. I get great results by drizzling a tiny amount of oil on a regular cookie sheet and spreading it around with a paper towel or my fingers before loading it up with veggies. So far I’ve never had them stick, and they come out nicely roasted and caramelized. I love the taste big chunks of roasted garlic give the veggies. Everyone in my family was surprised at how good those big pieces of garlic taste after they roast! Their flavor gets very mellow, a world away from fresh garlic. Don’t be afraid to use big pieces. Just chop the peeled cloves in half or thirds. Please let me know if you try these Paleo roasted vegetables and what you think. Are you as addicted to them as my family is? I would love to know any substitutions, additions or tips you have too! I have since discovered that Kosher Salt is way good for this recipe. It’s absolutely divine and in my opinion, makes the whole dish wonderful. Add some freshly ground peppercorns too. If you don’t have a peppermill and salt grinder, you should try them. It really makes a difference to use freshly ground pepper. These roasted veggies are life changing! Seriously. My whole family loves to eat our veggies now! Basically just chop up veggies, put them in a pan with a little oil and salt and roast until they are perfection! Lightly grease a large baking sheet with a few drops of oil. Prepare the veggies. 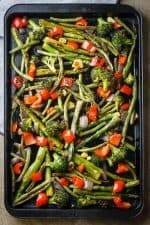 Cut the white ends off the asparagus and the tips off the green beans (optional), Chop the broccoli into florets, and the red bell pepper and peeled onion into large-ish chunks. Peel the garlic and chop each clove in half or in thirds. As you chop the veggies, place them in a large mixing bowl. Add the olive oil and salt and toss everything together. 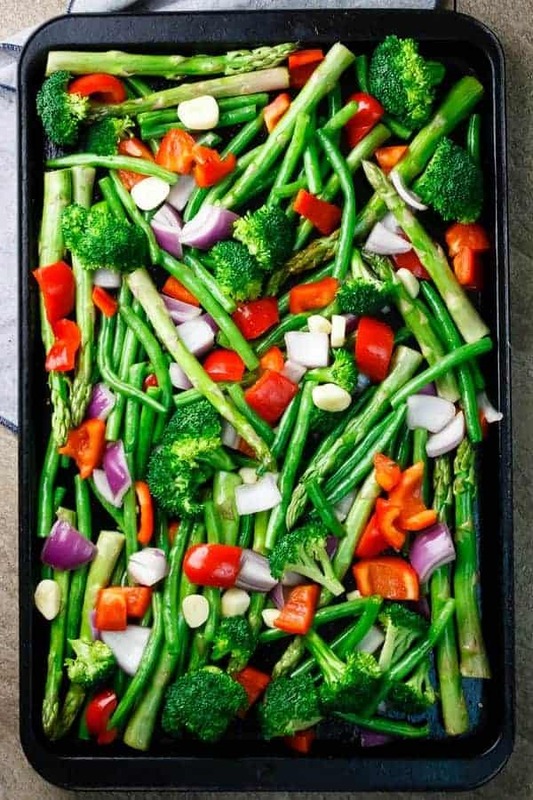 Spread the veggies out evenly on the baking sheet. Roast for about 10 minutes, then take them out and stir them around. Return them to the oven for another 10-12 minutes. Serve the veggies right away while they’re piping hot. Where is the recipe for the oven roasted green beans? I don’t see it on this page. The recipe is the same for any vegetable. Those green bean look delicious, I am definitely trying that recipe! They are delicious! My children fight over them every time.